He want one thing, make a big clean-up and get rid of the dirty noble that are tarnishing his country, William James Moriarty it ready to do everything to make his dream happen. Some Sherlock Holmes’s adventure see through eyes of this greatest enemy Moriarty, where the famous detective become the antagonist. I really guess I am more excited about this series than I was with Black Torch, it took me ages to write Black Torch first impression, but Moriarty the Patriot (gonna simply call it Moriarty for now on), this is something else. The first volume made me really curious, the second grab my attention a little bit more with the introduction of Holmes and the third just made me fall for that team of criminal, but not because they are good-looking (okay it does help a little, but because of how the character are. But before getting to that, let see if there is so negative point to that story, we all know it there is no perfect story without flaws. The main flaws that like made me wonder what the author was thinking is the historical inaccuracies. I love history, like really love, so soon as I found a story written in another era, I pay attention to the information given, Moriarty is set in the Victorian era, more specifically in the later part of the 1800. So if I see something that might not be belonging to the era, might laugh a little at the lack of study. I know sometimes is more for set thing apart, like make a group more important, more powerful, more scary, like giving AK 47 at a mysterious elite squad or putting the MI6 creation in the late around 1890 when it was created in 1909…. But putting that aside there is nothing that would actually make me run away from this story. From what I can tell with the three volumes I had read, the series seems to follow the simple storyline of having different case in the front with a subplot going in the back group. In this series the different case are presented as Moriarty and friend going after the dirty nobles and the subplot is (probably) Sherlock going after them. We had a decent introduction for Holmes, he wasn’t just throw in the series, he didn’t actively took part in on of the first act of the Moriarty group, but we could tell that he would be the thorn in William side. As I said in the introduction, the reason why I enjoy this series is because of the characters, but of course like in every series they are not all interesting. 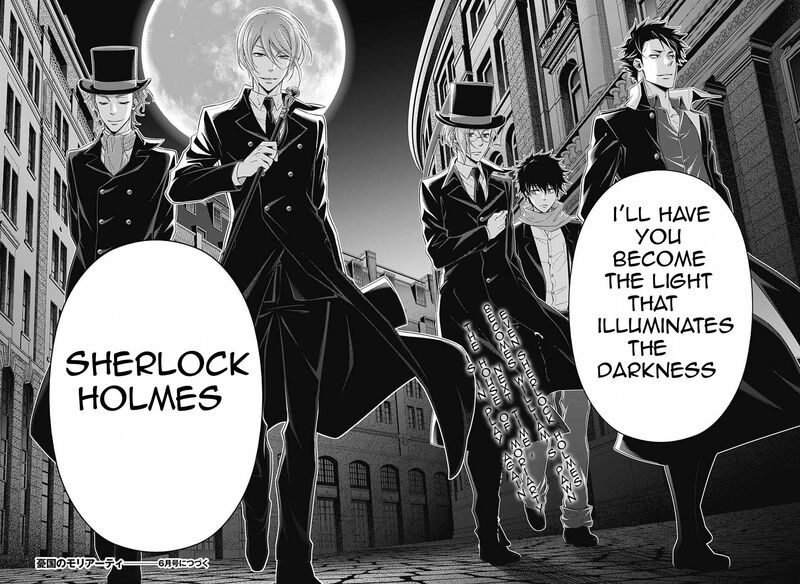 After three volumes, Moriarty group is composed of five people. 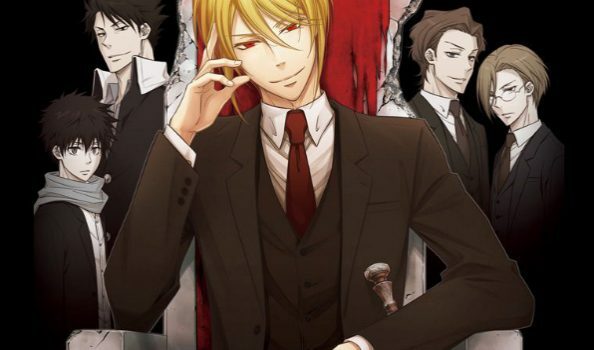 William James Moriarty our main protagonist, his younger brother Louis, his adoptive brother Albert and two of his friend, Sebastian Moran (Moriarty henchman created by Sir Arthur Conan Doyle, while both man share the same name a role, manga Moran seems more sympathetic than the one created by Sir Conan Doyle) and Fred. Louis is the younger brother who is ready to do anything to make sure his plan succeed. He harms himself to make the fire accident than burn down their house more believable. So far he doesn’t bring so much to the story other than being a support to his brother and giving him a reason the change the world in which they live. Another character that is there only because they need someone like that for the story is Albert, Albert bring the money and title for the group. He is the head of the Moriarty family, but he is really just a puppet, providing what William need to achieve his goal. Then we have Sebastian and Fred, not much is know about them so far other than Sebastian was once colonel and he fight in Afghanistan, I feel like something bad happen since he said to someone who Sebastian Moran is “death”. Same for Fred he seem to hide something. Maybe we will know more as the story progresses. The last member of the Moriarty group is of course the mastermind William. 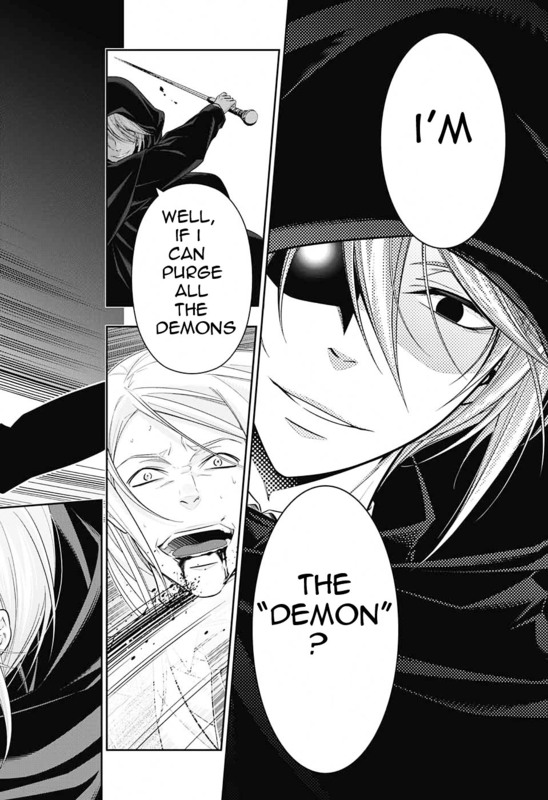 He is the Victorian counterpart of Makishima from Psycho-Pass, if Makishima wanted to free people from the Sibyl System, William want to free people from the corrupted nobles. I don’t like to draw parallel between character, since I don’t want people to only see the other character, but here it’s really difficult since they pretty much to the same thing, they both give the tools to other to achieve their goals and by doing that they both getting closer of their own goals. Plus they have a similar character design. We don’t know much about the background story of the character other than what we read in the beginning of the series, we don’t know why William and Louis was in the orphanage and why William is that smart, I suspect that it is just to fit the story (like putting the creation of the MI6 in the late 1800) but I would like to know more, there must be a reason why William hate the nobility so much. I can understand why Albert hate it even if he was born in a noble’s house himself, he just have to watch his own family going, this was enough to make him sick, but with don’t know anything about the brother prior the orphanage and I kind of hope we get some explanation later. Other characters introduced in those three volumes are Sherlock Holmes and Dr. Watson, I have to say that his Sherlock is probably one of the sexiest I have seen (next to Robert Downey Jr.) and Watson is a cutie pie that have to deal with Holmes antic. The fourth volume is announced to be available in April in French in Quebec, might give my thought on it on Twitter once I read it. Do you also follow the series or are you planning to read it ?